The cloud of glittering box office gold dust had barely settled on Annie Get Your Gun before Warner Brothers pulled the trigger on their own gun-toting musical Western. The result, Calamity Jane, is a rip-roaring, raucously delightful success. The parallels between the two films are obvious and the adversarial relationship between Calamity Jane and Will Bill Hickok clearly echoes the central Annie Oakley/Frank Butler rivalry of the earlier film. 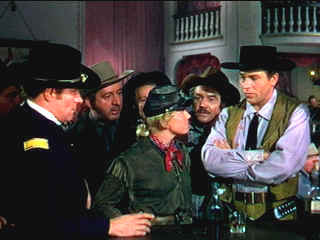 Calamity Jane scored another coup by getting Annie star Howard Keel to sing and spat with Doris Day's Calamity. The center of Deadwood City is Millie's saloon where the almost exclusive male audience hungers after female company. Calamity Jane, the buckskin gal with a man's swagger and a talent for stretching the truth an Indian or two trades banter with Wild Bill Hickok while she pines for Lt. Daniel Gilmartin. When Milly imports singer Francis Fryer from Chicago, he's up against the bar when Fryer turns out to be a man. Drag simply won't work, but it's Calamity Jane to the rescue. She volunteers to go to Chicago to recruit Adelaide Adams, the stage star who has captured the hearts of men all over the country. Calamity's gun sights are slightly bent in Chicago and she brings back maid Katy Brown in Adelaide Adams' clothes by mistake. The men in Calamity's life, as well as every other man in town, fall head over heels for the entertainer. Between the gunshots, dance hall numbers, moonlit rides, and stage coach rumbling, the romantic targets must line up logically before the sun sets on Deadwood. The musical numbers are outstanding including the romping rocking Deadwood Stage, the charming Just Blew in From the Windy City, the romantic ballads Higher than a Hawk and the Academy Award winning Secret Love. Ironically, the later song, perhaps Day's biggest recording hit, fails to have the same seamless plot integration that the other musical numbers achieve. The winning Day/Keel duet, I Can Do Without You, clearly parallels the thematic thrust of I Can Anything Better Than You in Annie Get Your Gun. The scoring is exquisite integrating the music of the songs to facilitate the scene transitions. The film finishes with a beautiful medley of the major songs. It's a high-spirited from the classic era. Calamity Jane not only delivers the music with panache and verve, every scenes provides consistently delightful humor. Day and Howard Keel are a charming pair and equally adept at putting over the musical numbers. Day gives an extraordinary high-energy performance. She leaps on the bars with a dancer's grace, postures with a tomboy innocence, and croons melodiously. Keel is an excellent musical comedy star. he plays bigger than life with grand strokes and of course, he's a terrific singer. Director David Butler shoots from the hip and the result is a crisply delivered narrative with perfectly in synch musical productions. Jame O'Hanlon whose wrote the final script for The Harvey Girls provides a charming framework for Butler to build his film. The charming script. Simple set-up and nice medley of characters. The DVD fails to deliver all the Technicolor celebration of Calamity Jane is her best clothes. It's still a wonderful experience, but it's somewhat diminished by the less than pristine source elements. The colors are slightly washed out. The print is mostly clean with almost an absence of grain. Black level is fine. There are a few shots that are somewhat soft, otherwise this is a crisply detailed transfer. There is some element damage in the bar scene and minor misregistration of the Technicolor elements shows up here and there. The score is given a clean mono delivery on the DV. The Movie Poster Archive includes extensive poster images from the films of stars like Susan Hayward, Kirk Douglas, Katharine Hepburn and many more. Our featured star is Doris Day. Marilyn Monroe wriggles and shakes her way as Sugar Cane to iconic perfection. Bily Wilder and co writer Diamond concoct some of the snappiest, slightly licentious, dialogue this side of Preston Sturges. The National Film Preservation Foundation (NFPF) is the nonprofit organization created by the U.S. Congress to save America's film heritage. Brad Lang continues to add more interesting material to the extensive collection at Classic Movies. Everything from actors and actress to your favorite directors is linked at the site.